Some groovy knowledge required. With the introduction of the new version of Label Tools for ScriptRunner Confluence, we allow users the ability to customise macro variables. We have introduced variables such as $fullname which can be used in the macro. When the page is rendered $fullname will be resolved to the users full name as specified in Confluence. By using ScriptRunner for Confluence it is possible to change the behaviour of $fullname or simply to specify your own variable. For example, you could create a variable $lastCommentDate which could resolve to the date of the last comment on the page. We will be looking at a simple Label Tools macro "Add Label", and how to add our own custom variables. Supplied variable labels are $username, $fullname, $year, $month, $day and $parent. Navigate to your script root. Default is <Confluence>/home/scripts. More information about script roots. Create the package com.onresolve.scriptrunner.canned.confluence.macros in your script root. Navigate to the package specified above and inside the macros folder create a new groovy class "AddLabelMacroModified.groovy" that extends the old class and overrides the setCustomVariables method. A descriptive class name is recommended. 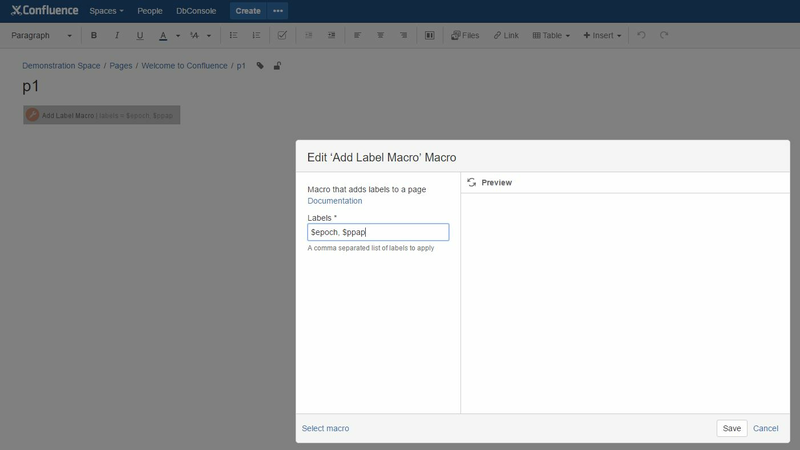 Disable the old macro in the Script Macros section in Confluence Administration. Enable the new macro in the same section. The names of the macros will be the same as to not break any macros already used. Notice the resulting labels on the page, the static specified string and a dynamic value (time since epoch in milliseconds).